First step is to remove the sides of the bread slices then cut the bread slices diagonally into two equal halves.Heat ghee in a deep frying pan over medium heat and deep fry the bread slices until turns golden brown from both the sides. Remove the bread slices and keep aside.Heat milk in a pan over medium heat and add ground cardamoms and sugar. Dip fried bread slices into milk and soak them for 25-30 seconds then take out the slices from the milk and set aside in a flat plate. 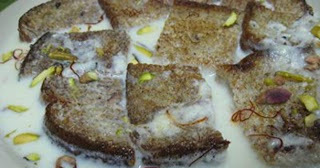 Keep inside the refrigerator for an hour or two.Meanwhile, mash the mava, add remaining milk and cook it over low-medium heat until thickens and form thick milk cream (rabdi).When ready to serve, spread the fresh, hot cream (rabdi) over the chilled bread slices and garnish with saffron leaves, chopped almonds and pistachios.